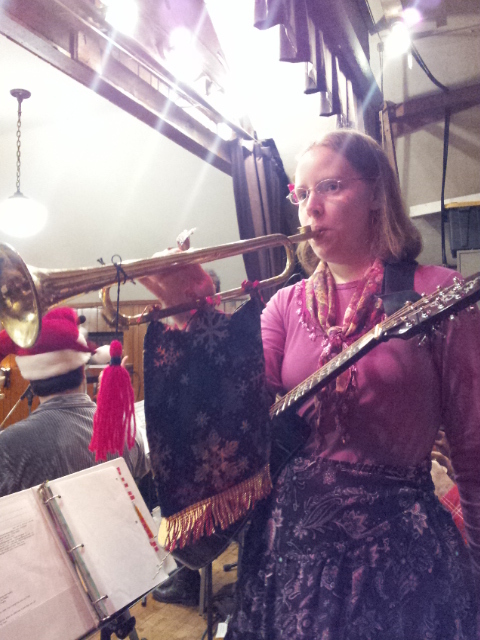 So this year I joined Abby again to play in the “Holiday Ball Orchestra” as I had done for the first time last year, for the annual Pittsburgh Contras and Squares Holiday Ball. Of course, I was much more prepared this second time than the first time. Not only have I been playing any music at all for an entire extra year, but also, I had prior knowledge of and access to most of the music that is played every year, so I could start my practice well before the event. Abby wanted me to dress up again. Since people enjoyed my wearing red pants last year, I wore them again this year. I was tired of the whole green thing, however, and so I wore a pink shirt and red vest to go all out on the red theme. I added a sport jacket also, one that had been too big for me my whole life till now; it turns out that my blazer that I wore last year is too small now, as my chest has noticeably expanded in the past year (probably because of weight lifting, posture changes, and playing wind instruments). 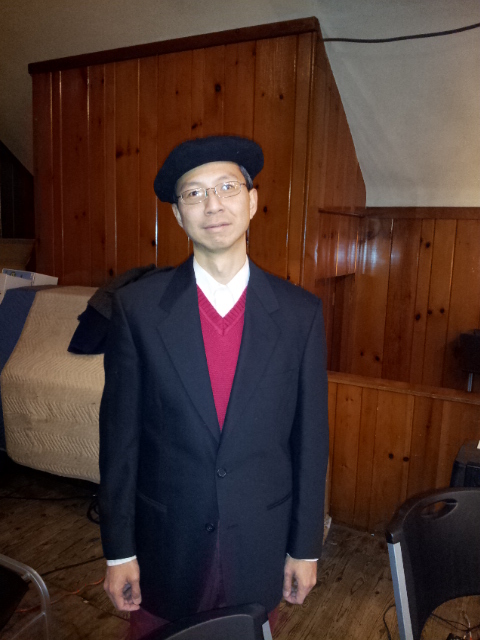 I added a beret that I’d never worn before. Abby came up with her own colorful outfit. I was afraid that Swisshelm Park Community Center would be super cold again like last year, but I did bring my Handeze fingerless gloves just in case. It turned out that the place was warm (it’s been a very warm “winter”), and so I did not have any problems feeling cold. 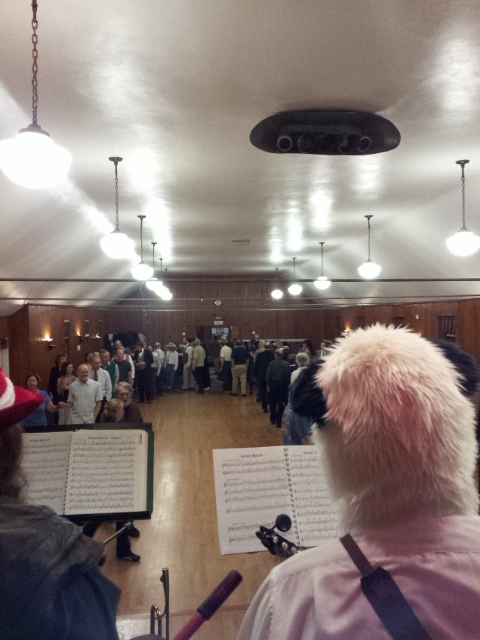 This year I think there were somewhat fewer musicians in the Holiday Ball Orchestra than last year. I thought this was actually a good thing. Last year there were some real problems with space and also with ensemble balance (there were a whole lot of violins last year, for example). 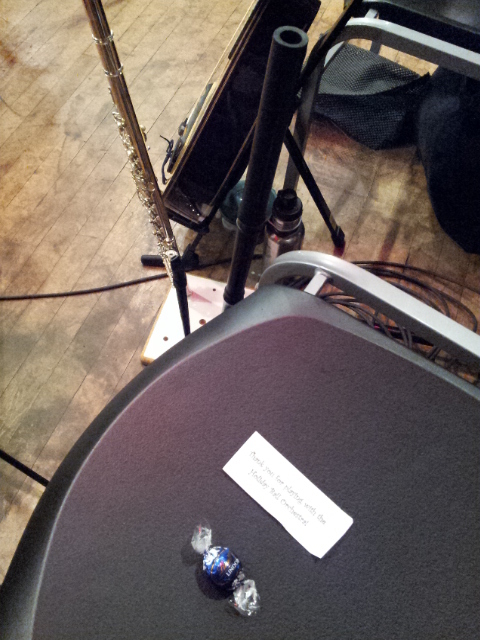 I brought my modern flute, wooden keyless Irish flute, and tin whistle. Last year I had played primarily recorder, but this year I chose not to play recorder at all: the Irish flute was what I wanted to use as much as possible for this music. I also brought my melodica! I had practiced playing the Hallelujah Chorus part of the Grand March using it and was excited to make my melodica debut. I also planned to use it in some of the Christmas songs, such as “Frosty the Snowman”. Abby brought an octave mandolin she had been borrowing. 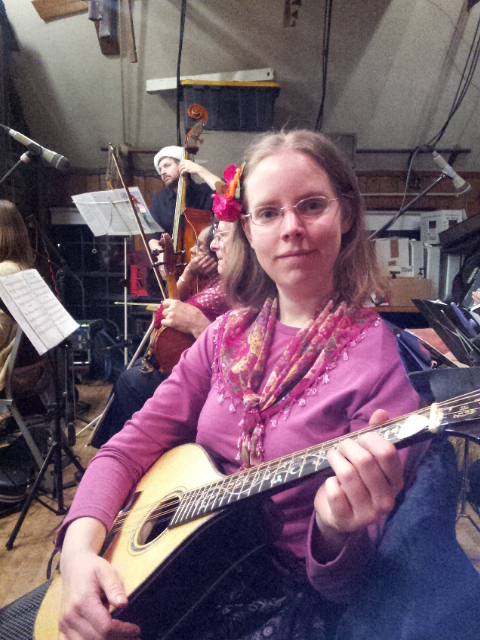 She started playing mandolin just this year, and octave mandolin just in the past couple of weeks, I think. This instrument is so much better suited to the music, she says, than her tamburitza she played last year. Several “kazumpets” (kazoo trumpets) were also provided by Lynette and Jim, and passed out to whoever wanted to play them during certain songs. Abby took one. Some of the other musicians were very excited about dancing and pre-arranged to spend one half or the other of the time dancing instead of playing music. I saw a lot of familiar faces among the dancers, thanks to having met some of them when doing French and contra dances at CMU, and others I met from non-dance contexts elsewhere in the past year in Pittsburgh. It was nice to see my friend Henry and his girlfriend Gina at the dance. Marlin was the caller again as usual and the evening proceeded with the Grand March and then the whole big assortment of jigs, reels, waltzes, Christmas songs, and a couple of interesting new pieces for this year. I don’t have additional interesting photos or videos to share from during the event, because I took none: after the initial Grand March, I was entirely focused just on playing music. I was far less nervous than I was last year. Also, I positioned myself near, rather than deliberately far away from, a microphone, in order to be more audible. I don’t actually know what I sounded like, but some dancers during intermission commented that they liked the sound of the wooden Irish flute, so I guess it must have been audible. Playing music for hours is tiring, especially when it is so fast and there are so many notes. Of course, nobody is required to play all the notes all the time. I picked and chose when to take breaks, typically alternating repeats or entire sections. And there is definitely a limit to how long I can play flutes before my mouth gives up. For the second half, a guy who had danced during the first half played a keyed Irish flute and tin whistle with us. I hadn’t seen him at the two of three rehearsals I had attended, so I hadn’t known someone else would be playing those instruments. As a result, I changed some things up in the second half, by playing the tin whistle sometimes when he was playing the flute, and vice versa. I did play the melodica as planned, but noticed that the intonation was poor in the lower notes, so I backed off. I’ll have to fix this problem before I do more melodica playing. I chose not to force myself to “achieve” some of the “goals” I set last year, which were to do some solos and nontrivial ornamentation/improvisation. I felt that because of the natural of my musical focus all this year, I hadn’t had time to devote to getting good enough to really justify taking the spotlight for some tunes. The music is still crazy fast: I am still not able to play everything quite properly at the appropriate tempo. Frustrating, but that’s OK. I expect to continue to improve my technique; I’m already so much better than I was last year. I very much enjoyed performing for the Holiday Ball this year. And I feel like the Holiday Ball Orchestra sounded better this year than we did last year, and some dancers remarked on this also. I think there are several reasons for this. One is that we had some people coming back for the second time (like me), much improved. Another is that there were slightly fewer people, which I think creates a tighter ensemble. Right now, I’m just totally exhausted and happy to be done with music performance of any kind this year. It’s been a very tough week, a very tough month, and a very tough two months in my life, with all the things that piled up on me since the end of October. Because December always ends up being so frantic for me, for next year I need to better plan what activities I pursue during this time of year. Last year, I was totally set on playing again this year in the Holiday Ball. Now, I am not sure whether I will continue for next year. It’s a question of priorities, and I need to plan what I will be doing next year in December. If I do it again next year, then clearly I want to be doing some solos! Again, I have to thank Lynette for organizing the music scores and putting it into booklets for everyone. Jim made the kazumpets. Donna, Allison, and Maro led the rehearsals as well as conducted and played their instruments with enthusiasm; I’ve been really happy to have met them a year ago, because I’ve been encountering them in other musical contexts in Pittsburgh in the past year too! We play for the dancers, and so I really appreciate it when they take note of our playing and respond to it. And none of this would happened without Abby, who got me into the whole scene in the first place. I’ve met so many musicians and dancers, and tried out different instruments and musical styles and dances in the past year, thanks to Abby!